"Corruption by Proxy" is a major theme Schweizer examines, and he describes it as "A new corruption that is extremely difficult to detect is taking over our political system," and "it is most lucrative; instead of thousands of dollars, the sums amount to millions or even billions." Schweizer writes, "The 2016 election left Americans deeply divided. Some found themselves enthused and encouraged by the outcome. Others were disappointed and depressed. But the vast majority of the American people were unified about one thing: the belief that corruption is rampant in Washington. Polls revealed that three out of four Americans believe that there is 'widespread government corruption' in Washington, and perhaps the holdouts are not paying attention. The concern over widespread corruption is growing. The number was two in three back in 2009. "Politicians who practice corruption have created a crisis of confidence in our government. Only 19 percent of the American people in a recent survey trust the federal government to do the right thing. "Americans have known for quite some time that some politicians make themselves rich through public service. Who could forget Louisiana congressman William Jefferson stashing $90,000 in bribes in his freezer? Or Congressman Randy 'Duke' Cunningham who created a 'bribery menu' that netted him $2.4 million? Then there was the 2006 Jack Abramoff bribery case that led to a flurry of convictions in Washington. The lobbyist had given gifts to politicians in exchange for favors. Abramoff was sentenced to four years in jail. Congressman Bob Ney pleaded guilty to taking bribes from Abramoff and was sentenced to thirty months in jail. Congressional aides for no less than five congressmen pleaded guilty to corruption, conspiracy, obstruction of justice, and bribery charges, as did executives in the Bush administration from both the Department of the Interior and the Justice Department. "Other forms of corruption have been exposed over the past decade that, while not leading to jail time, have led to great public scrutiny and embarrassment. In my book Throw Them All Out, I exposed insider trading on the stock market by members of Congress. When the book was published and featured on 60 Minutes, it set off a national firestorm that led to the passage of the Stop Trading on Congressional Knowledge (STOCK) Act. In my book Extortion, and in another 60 Minutes story I revealed how politicians enriched themselves using mafia-like tactics. In Clinton Cash, I laid out how the Clintons monetized access and official favors. Polls conducted in 2015 and 2016 showed that a sizable portion of the American public believed that the Clintons were corrupt. And the Federal Bureau of Investigation launched an investigation based on the book's findings. "Following the money in those projects was simpler, using financial disclosures required by law. "The corruption by proxy that is the subject of this book is far more troubling and difficult to detect. Because the transactions involved do not fall under disclosure laws, they are invisible or, at least, hidden from public scrutiny. Financial deals channeled through politicians' family members do not require disclosure. Identifying deals and the parties involved takes intense research. These transactions nevertheless make good money for a politician and his family and friends. Politicians are constitutionally obligated to make decisions that are best for the people they serve. These deals direct the politician's loyalty elsewhere." 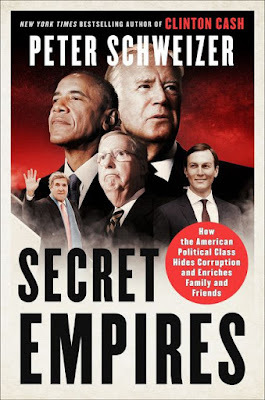 In Secret Empires, Schweizer reveals how Senate Majority Leader Mitch McConnell and his wife, Secretary of Transportation Elaine Chao have a deep relationship with China. As McConnell's hardline position on China softened, money flowed, not only doubling their net worth, but placing a family member on the board of the government-run, powerful Bank of China ten days after Donald Trump's election as president, and two more family members on the board of one of the Chinese government's largest military contractors. Schweizer looks into what he terms the Smash and Grab: how President Barack Obama enriched his friends by smashing certain sectors with outrageous regulations, dramatically driving down their valuations, sometimes to pennies on the dollar. Who would come in and buy up these companies on the cheap? Some of President Obama's oldest and dearest friends. Presidential children weren't always under intense scrutiny. For the first time, Schweizer examines how the son of Vice President Joe Biden and Stepson of Secretary of State John Kerry scored billion dollar deals with foreign governments as their dads shaped foreign policy. Ten days after Joe Biden and his son Hunter flew aboard Air Force Two to china, Hunter and Kerry's stepson, Chris Heinz, closed a one billion dollar deal with a subsidiary of the Bank of China. They profited immensely from secretive deals with companies connected to the Chinese government while their dads were negotiating sensitive issues with the Chinese government. Schweizer writes of the Biden and Kerry dealings, "Joe Biden and John Kerry have been pillars of the Washington establishment for more than thirty years. Biden is one of the most popular politicians in our nation's capital. His demeanor, sense of humor, and even his friendly gaffes have allowed him to form close relationships with both Democrats and Republicans. His public image is built around his 'Lunch Bucket Joe' persona. As he reminds the American people on regular occasion, he has little wealth to show for his career, despite having reached the vice presidency. "One of his closest political allies in Washington is former senator and former Secretary of State John Kerry. 'Lunch Bucket Joe' he ain't; Kerry is more patrician than earthy. But the two men became close while serving for several decades together in the U.S. Senate. The two 'often talked on matters of foreign policy,' says Jules Witcover in his Biden biography. When John Kerry was the Democrat nominee for president in 2004, Biden had been on the 'short list' as his running mate. It was widely believed that if Kerry had won in November, he would have selected Biden as his secretary of state. So their sons going into business together in June 2009 was not exactly a bolt out of the blue. But with whom their sons cut lucrative deals while the elder two were steering the ship of state is more of a surprise." In 2009, Biden was Vice President, while Kerry was still in the Senate. Kerry became Secretary of State for President Obama's second term in 2013. Schweizer continues, "What Hunter Biden, the son of America's vice president, and Christopher Heinz, the stepson of the chairman of the Senate Committee on Foreign Relations (later to be secretary of state) were creating was an international private equity firm. It was anchored by the Heinz family alternative investment fund, Rosemont Capital. The new firm would be populated by political loyalists and positioned to strike profitable deals overseas with foreign governments and officials with whom the U.S. government was negotiating." Finally, Schweizer asserts that the Trump children are, without a doubt, target of foreign governments. Schweizer previews how foreign entities can make inroads with Ivanka Trumpa and her husband, Jared Kushner, who serve in the White House; and the two sons left to run the Trump Organization, Donald Jr. and Eric, to attempt to curry favor with the current administration, preying on their well-documented financial vulnerabilities. Schweizer writes of the Trumps, "Eric and Donald Trump Jr. chose not to join father in the White House. Instead, their role has been to run the Trump family empire. Still, it cannot be overstated that foreign governments and businesses are going to be eager to grant favors to the Trump Organization because they expect that it will help them with the president. Their expectations are certainly not grounded in America's best interest, and the appearance of such collusion is both demoralizing to American citizens and encouraging to corrupt players around the world. "Even before he was elected, we saw this happen when President Trump spoke with Argentina's president. A previously stalled Trump building project in that country was revived when the government granted the necessary building permits. The Argentine paper La Nacion reported that 'Trump asked for them to authorize a building he's constructing in Buenos Aires, it wasn't just a geopolitical chat.' Spokesmen for both presidents deny the subject came up. And in many ways, it didn't need to. Foreign governments know that money talks. By helping American politicians and their families in the pocketbook, they are more likely to get favorable outcomes when they talk to them about other matters. "Just weeks after Donald Trump was inaugurated, a Chinese businesswoman named Angela Chen, who also goes by the names Xiao Yan Chen and Chen Yu, bought a penthouse in Trump Park Avenue, a condo on Manhattan's Upper East Side, for $15.8 million. Formerly occupied by Ivanka and Jared, Chen purchased the property from Trump Park Avenue, LLC, an entity controlled by the Trump Organization, so the deal effectively resulted in money in President Trump's pocket, or estate. Curiously, the penthouse was not on the market at the time and had no listing price. "Chen also chairs something called the China Arts Foundation, started by Deng Rong, the daughter of former Chinese leader Deng Xiaoping. Deng Rong served as the vice president of the China Association for International Friendly Contacts (CAIFC), an affiliate of the intelligence and foreign propaganda division of the People's Liberation Army. CAIFC has been called a front for Chinese intelligence by academics and government experts. Its offices are reportedly located in a Beijing compound used by military units. "Another pattern began shortly after Trump was elected. The governments of Bahrain and Azerbaijan held national and religious celebrations, respectively, at the Trump International Hotel, just blocks from the White House. Trump has wisely promised that once he was elected any profits from such visits by foreign officials would be donated to federal coffers. This is great but requires intense monitoring. There can be no doubt that these governments expect that by throwing business at the Trump family they will get favorable treatment in return. As we have seen throughout this book. in many foreign regimes, this is how political business is done. Trump, a U.S. president, and his children, as the first family, must maintain the diplomatic standard that this is not how political business is done in a constitutional republic. "Like Kushner, the Trumps have financial vulnerabilities. They owe $300 million in loans to Deutsche Bank, the German financial behemoth that has run into trouble with the U.S. Department of Justice over its banking practices. The Trump Organization also owes hundreds of millions to the Bank of China for its real estate projects. "For those keeping track, the Bank of China has already positioned itself well by partnering with the Bidens, placing the sister-in-law of the Senate majority leader on its board of directors, and now is a major lender to the president of the United States' company. "Biden and McConnell aside, the question for Trump is: How will these loans play out? Will the Trumps be pressured or encouraged by their bankers to carry out policies for their benefit? It is unclear at this point and a game of vigilance. Some might argue that loans by themselves do not amount to much leverage. As John Maynard Keynes once said, 'If you owe your bank a hundred pounds, you have a problem. But if you owe a million, it has.' Still, if you have to refinance your loans, you might be offered favorable rates...with silk strings attached." Secret Empires shows that corruption in politics is not unique to Democrats or Republicans, the blue or red side, but the color that really is entrenched in politics is green, the color of money.